Penhaligon’s, the eccentrically British perfume house, is a curious outfit. Their historic back catalogue of perfumes is full of straight-laced florals, robustly masculine eau de toilettes and even some exotic follies. Over the last few years however, the brand has made a definite move away from the stiff upper lift of the past and have released a bunch of quirky fragrances that range from filthy florals that can only be worn after the watershed (Amaranthine) to contemporary takes on traditional themes (Sartorial). They’ve even flirted with the British’ love of gin cocktails (Juniper Sling) and have pushed the olfactory envelope to dizzying heights with the bizarre and whimsical (Tralala). So yes, Penhaligon’s have modernised and funked-up their image of late, but they’re not afraid to return to their traditional roots – and that’s exactly what they’ve done with their latest masculine fragrance ‘Bayolea‘. Created as a reformulation of a bay rhum fragrance from the Penhaligon’s archives, Bayolea has been chosen to scent the brand’s new, and rather extensive grooming range, as well as front the collection in its Eau de Toilette form. Without giving too much away at this stage, it would be safe for me to say that Bayolea is an impeccably well-groomed fragrance that feels perfectly suited to any gent – modern, traditional or otherwise. Bayolea opens with a familiarly traditional blast of herbs, spice and citrus. In the initial stages its especially lemony with a strong undercurrent of black pepper that together, bring zing a spice. A strong clary sage-impression comes through and adds a gauzy effect that provides a softly-barbershop texture to proceedings, ensuring that there is some weight to all that citrus fizz up top. The heart is the domain of lavender and in Bayolea’s case the note feels icy and mineral-like, conjuring up the image of translucent purple glass. This lavender presents itself in a light format that is devoid of any sweetness and instead amplifies the flower’s naturally mentholated and herbal facets, serving as a nice olfactory nod to gentlemanly fougères of the past, without being a literal, or even obvious translation of the genre. As Bayolea dries down it maintains its gauzy texture but ultimately becomes more robust and woody. Moss and patchouli work together to create a sour and light chypre accent that creates a nice contrast to the pleasantly citrus-centric opening. The subtle spice of cedarwood chips intensify the sharpness and play nicely into the hands of a fresh and diffusive musc. The overall impression is a balanced woody-green chypre that surprisingly straddles the gender line non-discriminately. With Bayolea, Penhaligon’s have created a traditional masculine fragrance that wouldn’t feel out of place on the bathroom shelf of a modern man. As with all things the brand puts their hand to, it’s nicely pieced together, evoking the image of a fancifully fragrant gent with a good sense of style and well-adhered-to grooming regime. It wont set any hearts on fire as something wildly original, but it does smell pretty darn good and serves as a respectful nod to the Penhaligon’s masculines of the past. 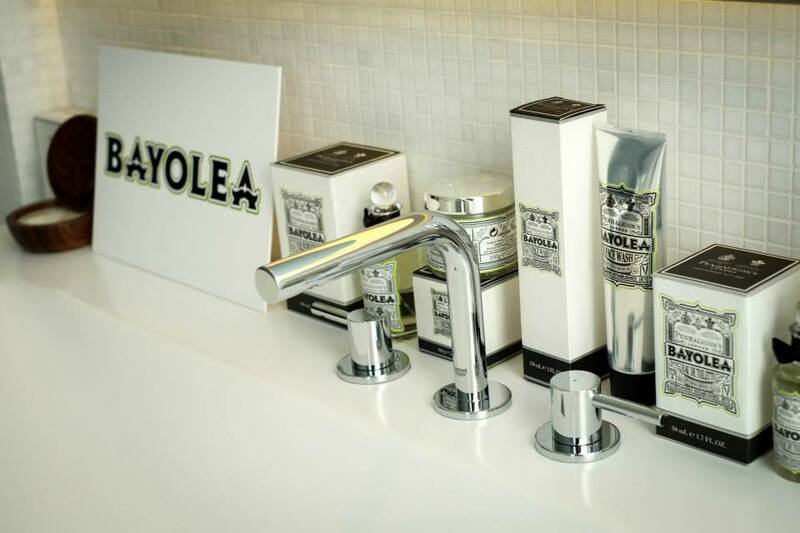 Bayolea is available in 50ml (£65) and 100ml (£85) Eau de Toilette. An extensive grooming range scented with the fragrance is also available. Sample, notes and quotes via Penhaligon’s. 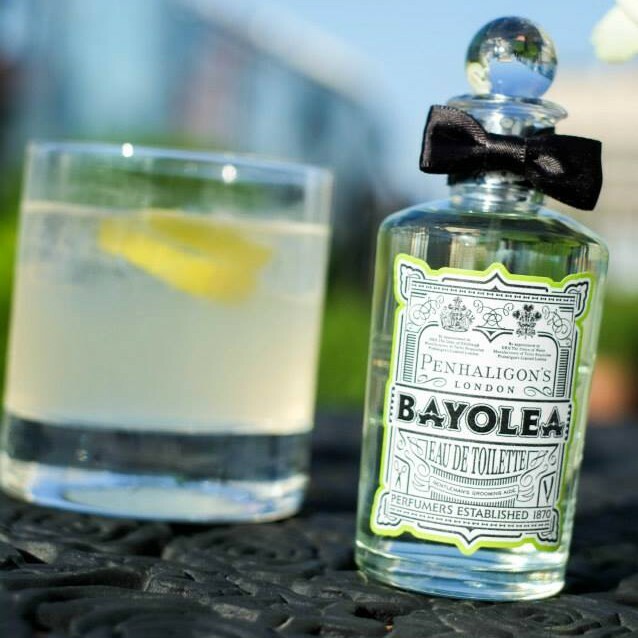 Images are of the Bayolea launch from Penhaligon’s Facebook page. Image 2 is cropped. Posted in Masculine, Penhaligon's, Perfume Reviews, Woody and tagged Bayolea, Grooming Range, Masculine, Penhaligon's, Perfume Review, Woody. Bookmark the permalink. Haven’t smelled the perfume yet, but I love the logo. The two little moustaches on the ‘A’s are most cute and quirky. I tried this briefly on skin, and was very pleased to find that it wasn’t particularly herbal on me. The citrus notes seem to carry through. I will experiment further when I catch up with a sample, but it strikes me so far as a nicely pitched launch – obviously the grooming products are aimed at men, but the women can pinch the cologne! Nicely pitched is a good way to describe it. If you were to ask me what a Penhaligon’s grooming scent should and would smell like, I think I’d imagine something very close to Bayolea. I really liked this on Vanessa and Nick. V got all the zingy citrus straight off but I also really liked the later stage of herbs on Nick – freshly picked rather than herbal/medicinal. I think they’ve pitched it just right. Perfect for the grooming range and as a stand-alone EDT. The mixture of the citrus zingy-ness and those lovely herbs is very pleasing. It’s good to see that different skins are picking up different facets. On me, I get that barbershoppy clary sage.